by Sunburst Software Solutions, Inc. If you are using QuickBooks to manage your inventory, you need to understand how QuickBooks deals with the cost of inventory items. Unfortunately, the term “cost” is used in several different ways, and it can get confusing. Here is a quick rundown of how QuickBooks handles things. I’ll focus on Inventory Part items, which are the true “inventory” items in QuickBooks, with a little detour to talk about Inventory Assembly items. If you look at an Inventory Part item, you will see that there are two cost fields. Cost, on the left, is a “reference” field. That is, it doesn’t have any direct bearing on the valuation of your inventory, the cost of your inventory in your inventory asset account. I wish they had another name, because it is confusing to talk about it. I refer to this as the “last purchased cost”, although that isn’t always exactly right. If you purchase an item and receive a bill for it, the cost that you receive the item at will usually be stored here (but not always, that depends on how your company file is set up). You can edit this cost directly in this window. This does not have a direct effect on your inventory valuation. The avg cost field, bottom center, is the field that is used in the calculation of the value of your inventory. This is calculated by QuickBooks based on the cost of receipt (and adjustment) transactions. You cannot directly edit this in this window. If you look at the edit item window for an Inventory Assembly item you will see a third cost, the total bill of materials cost, which is another “reference” cost (not directly affecting inventory valuation). I’ll discuss that in more detail later. QuickBooks values your inventory using an average costing calculation, as opposed to other types you may be familiar with, such as LIFO, FIFO, or specific costing. This can be a complicated subject – I am only going to go into this lightly. Let’s look at a simple example. 10 items and a value of $10.00, we added another 10 items at a value of $20.00, so, you will see that the cost is $1.00, and the avg cost is also $1.00. You have $10.00 of inventory in your inventory asset account. If I then receive another 10 items, but at a unit cost of $2.00, you will usually see the cost value set to be $2.00. However, the avg cost of your inventory will show as $1.50. We started with we have 20 items with a value of $30.00. That gives us an average cost of $1.50. If you sell one of these items in an invoice, the Cost of Goods Sold (COGS) account is incremented by the average cost of the item at the time of the sale. One thing that I will note, briefly – if you sell all of your inventory, and then continue to sell the item so that you go to a negative quantity, the costing calculation runs into problems. QuickBooks can’t accurately account for a negative balance, and you can see some very odd figures show up in the average cost field, and your inventory valuation reports. Once you bring the balances back to positive these figures should resolve themselves, but it is always a good idea to not allow inventory balances to go negative. Editing the cost field in an inventory record will have no bearing on the avg cost, or your inventory valuation. The only way to directly change the avg cost or valuation is to use the inventory adjustment function and do a “value” adjustment. Let’s take a look at an inventory assembly item. The WHAS wheel assembly has two components, a screw (two of them) and a roller. Note that there are three costs shown in this window. The Cost field (15.00) has no real bearing on valuation of this item as I have discussed above. The Avg Cost field (32.00) is the cost that QuickBooks uses to calculate the value of this item. The Total Bill of Materials Cost field (32.00) is not directly tied to the cost or avg cost values. This is the sum of the cost values of the components in the BOM. In our starting example it matches the avg cost, but they are not connected. If I build this assembly item, the avg cost of the assembly will NOT be adjusted by this total bill of materials cost. Instead, QuickBooks will take the avg cost of the component items and roll that into the received cost of the assembly. You can’t look at this screen and tell what the exact cost of the build will be. Remember, the total bill of materials cost shown here is based on the cost field of the components, not the avg cost value. But avg cost is what is used in valuation. For a more detailed explanation of costs in inventory assembly items, see my article on Understanding Total Bill of Materials Cost in QuickBooks. My company imports goods from an overseas supplier. We are charged freight by this supplier on the same invoice, so that freight cost is very easy to allocate to the stock items on the invoice on a percentage of total goods on the invoice basis. I have a problem when it reaches the port though. We have a logistics company take care of getting it through customs, etc. and getting the good transported to our warehouse, for which they charge us. This company is obviously different to the supplier of the goods. Now my problem is: how do I allocate the costs from the local logistics company to the goods that we bring in? My current cost of goods is obviously reflected lower than they are in reality, and expenses are reflected as higher than they are in reality. Is this possible in QB 2012? Is this possible in QB 2013? I’ve tried everything I can think of to get this right in QB 2012, and I don’t think it can be done there… At the moment, I do the allocation manually via an Excel spreadsheet – very tiresome and time-consuming as you can imagine. Please help in any way. My pleasure, Nancy. And thank you for the guest article on the Sleeter blog. Thanks so much for being a guest blogger! Inventory is my weakest area in QuickBooks and your article is very helpful. QuickBooks – Print function disabled for W2’s, 1099’s, etc. Nancy Smyth, Sunburst Software Solutions, Inc. I've been using and supporting QuickBooks products since the early 1990's. I've worked with thousands of contractors, assisting them with QuickBooks setup, Certified Payroll Reporting requirements, AIA Billing and Weighted-Average Overtime. QuickBooks is a powerful product, but learning how to use it in your construction business can be difficult. I hope you find resources available here to be helpful. We've been selected by TSheets as a Top QuickBooks blog to read in 2018! We promise NOT to sell, rent, or otherwise distribute your name and email address! Request FREE 30-day Trials of QuickBooks add-ons for Certified Payroll, AIA Billing & Payroll Wage Management. Save time and increase accuracy on time-consuming error prone tasks; so you get paid on time! Learn how to complete a Certified Payroll (Prevailing Wage) Report and fulfill your reporting requirements - 2 hour recorded webinar - $99.99. Click here for more info. Learn how to get the MAXIMUM possible results from QuickBooks in your construction business! Visit our new QuickBooks training website, Learn to use QuickBooks in your construction business. The QuickBooks for Contractors blog is a free QuickBooks Support & Training resource provided by Sunburst Software Solutions, Inc. Copyright 2000-2017. All Rights Reserved. QuickBooks® and the Gold Developer Logos are trademarks and or registered trademarks of Intuit Inc., displayed with permission. 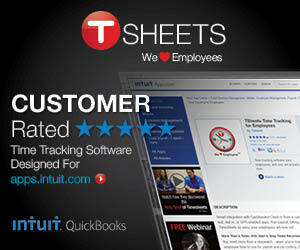 For use with U.S. version of QuickBooks only. Powered by WordPress and WordPress Theme created with Artisteer by Nancy Smyth.